Dr. Nikola Tesla: English / Serbo-Croatian Diary Comparisons . 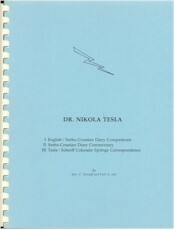 . .
Parts one and two of this book document variations that exist between the English and the Serbo-Croatian versions of Nikola Tesla�Colorado Springs Notes, 1899-1900. The CSN Commentary section has been translated and reprinted in its entirety. Part three consists of a number of letters and instructions to shop workers that were written by Nikola Tesla, George Scherff and Fritz Loewenstein during the time the Colorado Springs Experimental Station was active.